We're happy to present you with the first pictures of the 43.5m motor yacht Baron Trenck, recently delivered by Italy's Eurocraft yard. Project number 507, Baron Trenck is an explorer superyacht built in steel and aluminium to RINA class and MCA compliant. Accommodation is for 10 guests in a master suite on the main deck plus two double and two twin staterooms on the lower deck. Twin MTU 12V 2000 M6 engines give Baron Trenck a cruising speed of 12 knots and a maximum speed of 14 knots. 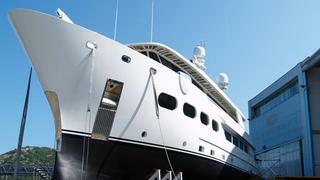 Baron Trenck is listed for sale on boatinternational.com by Ocean Independence asking €16.3 million.